Daily Slideshow: These Racing 'Vettes set the pace for Porsche and BMW. John Greenwood built his first tube frame car as a teenager... powered by a 2.5 horsepower lawn mower engine. He got his hands on his first Corvette in 1964, and in 1968 he bought a new Stingray and put an L-88 engine in it before the night had passed. He got the racing bug and took that car to a driver's school. By 1969 he had started his own team and won his first races. More successes followed, including taking home SCCA A-Production championships the next two years. John's cars took on B.F. Goodrich-backed cars in a 6-hour enduro for street-tire shod cars, held at Michigan International Speedway in 1971, and finished ahead of them and everyone else too. This naturally attracted the interest of BFG, who asked him to prepare a three-car team to run their new Radial T/A street tires in five long-distance races, against a field of cars on racing slicks—including Daytona, Le Mans, and Sebring. The publicity for BFG was great and the Greenwood Corvettes soon established a reputation as being the loudest cars on the field. In 1974 Greenwood unveiled his new wide body cars. Zora Arkus-Duntov actually helped with the development of the new fender flares as did Randy Wittine, who assisted with the aerodynamics. IMSA rules allowed them to widen the bodies, accepting wider tires of course, but, more significantly allowing them to act as wings and creating downforce. The flares, it almost seems silly to call them that because they were more like pods, were open at the back, venting heat and reducing lift. >>Join the conversation on the Greenwood Corvettes right here in Corvette Forum! IMSA rules also allowed Greenwood to lower the nose and hood-lines of the cars, in effect turning the whole front of the car into another big wing. One strategy the team employed to get all of this aero past the IMSA rule-makers was to submit the first widebody car with a belly pan that was expressly forbidden. That gave the race police something to bust Greenwood for, and it may have distracted them just enough to let the unprohibited, but tricky, new additions stay. 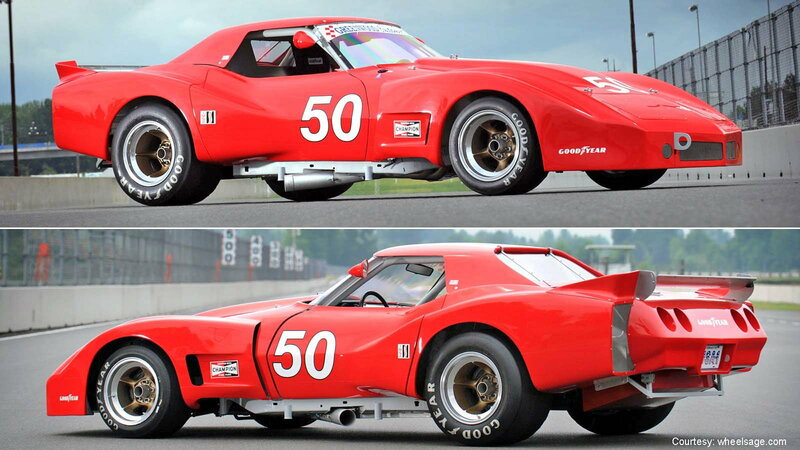 At this point, the chassis was still production-based and used modified Corvette frames, but a huge amount of work was done on the suspension by Bob Riley of Profab (who was also working with Jack Roush and Ford at that time). Greenwood started producing the wide body cars for interested customers. While only two of the original examples had coil-over springs at all four corners, many of their later campaigners converted their cars to that spec. Although, in some racing series a transverse leaf was left in the rear suspension merely to satisfy the rule book. Three of the wide body cars were also acid-dipped and many had body parts molded by American Custom Industries (ACI). 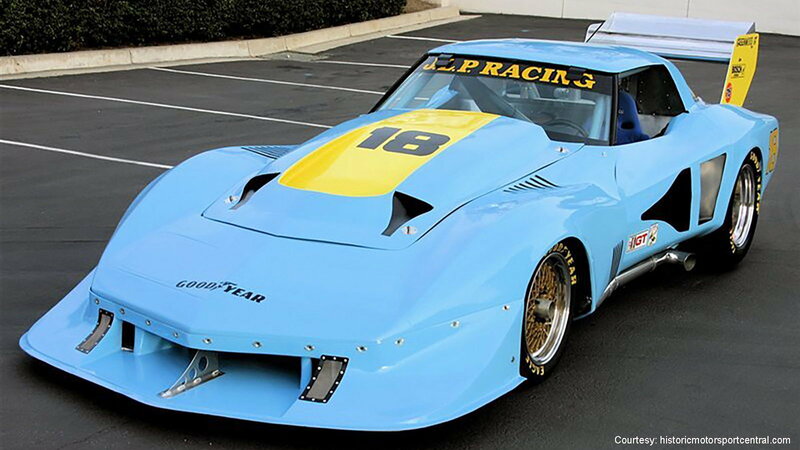 By 1975 Porsche and BMW had adopted the open fender design of the Greenwoods, but the Corvettes still remained competitive in their classes. The automotive press called the original widebody car the "Batmobile." It was this same Greenwood team car that was used for much of the initial chassis and suspension testing. The car changed sponsorship and paint schemes throughout its first season and was driven by Sam Posey and Milt Minter, among others. 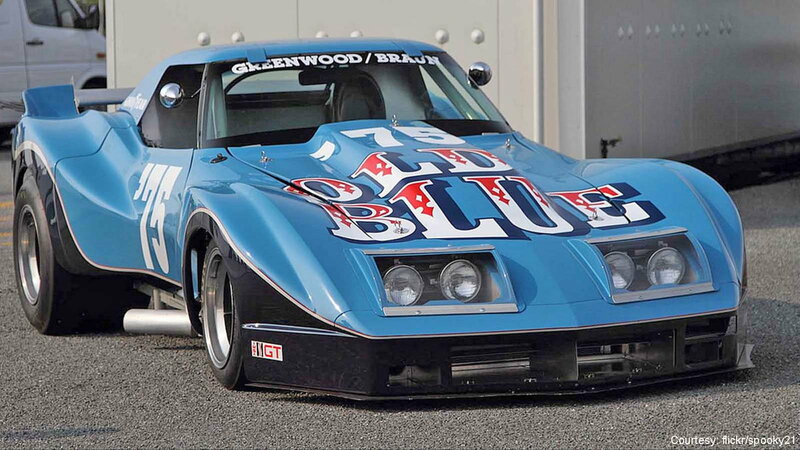 John Greenwood and Canadian Rudy Braun ran it in the "Old Blue" livery you see here. The paint scheme was designed by Rudy's countryman, graphic artist Paul Smith, and the pinstriping and 'dog' graphics were done freehand. 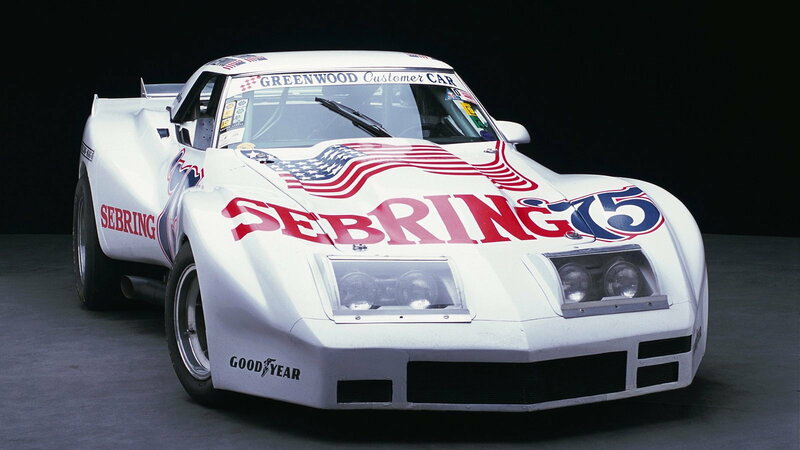 After the 1976 season, Greenwood and company developed their first full tube-framed car, dubbed the "Winged Thing." 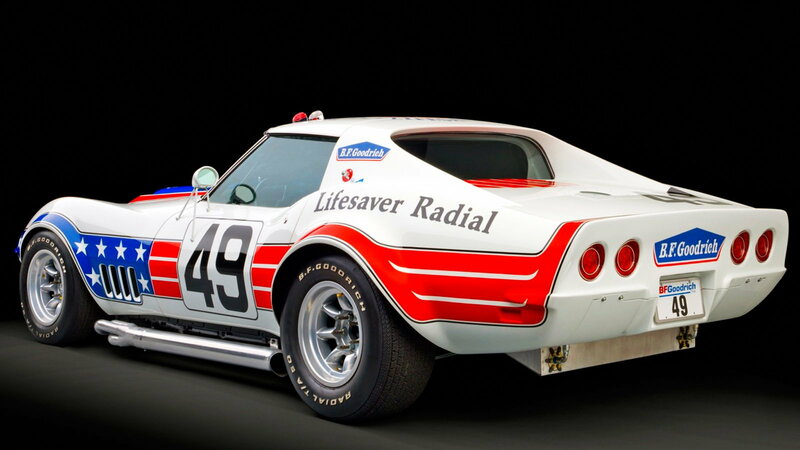 It debuted at Brainerd, MN in 1977 and was sold to racer Jerry Hansen later that year. Their second car was purchased by John Paul, Sr. and raced in the colors you see above. In addition to the specialized new frames allowed by IMSA and SCCA rules, these cars carried all-aluminum 467ci Can-Am engines with Kinsler fuel injection, mounted further back in the chassis than before. With 770hp and over 700 lb-ft of torque, the cars chewed up driveline components and later owners ended up detuning the engines to preserve the parts downstream long enough to finish races. 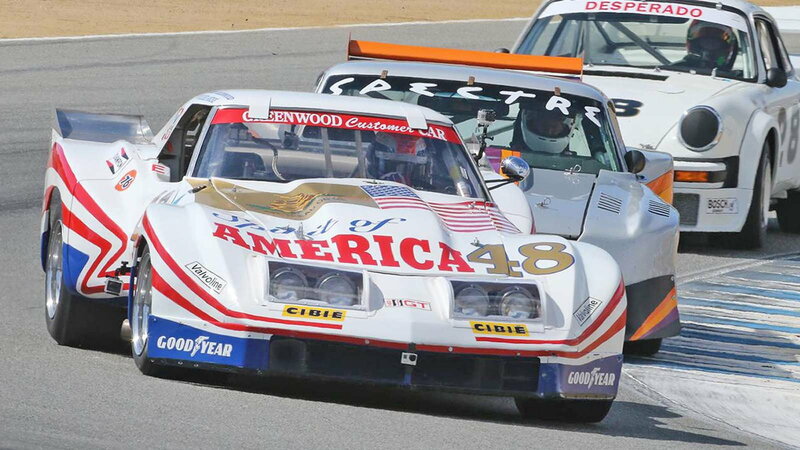 Though Greenwood himself found funding for his racing efforts drying up, these cars, with help from constant development and upgrades like Porsche 935 brakes, were competitive into the early 1980s. For help with your do-it-yourself maintenance and repair projects, please visit our how-to section in the forum.